How I count my months! Usually people count the months by the exact date. For example- My last relaxer was back in March 2, 2011 so if I counted the months every time it hits day two I will be 6 months and 4 weeks post relaxer. Now according to how I count my months, Im way ahead of myself. I count my months in weeks. Every four weeks is an official month to me. So, my method will have me at 7 months and 2 weeks post. Crazy, no? Hope I did not confuse anyone- but thats how I count my months, weeks- not days. Best method for washing my transitioning hair!! After searching and watching a lot of YouTube videos, I came across a method that I have been wanting to try for months now. I finally got to it today. I am so happy and excited because this particular method has helped my hair to not tangle (not even one bit) after washing my hair. These are all my favorite products- My hair cant do without them. These have been the products that I have been using since my hair journey- and some even before being on a hair journey! These are MY personal likings. I always recommend people to try things out for themselves and see how it will work for them--- Always keep in mind that what may work for someone does not necessarily mean that it will do the same for you. I am very happy to have shared my stash with you all..........Hopefully when I am fully natural my natural hair does not reject any of these products. I highly doubt it since they are doing wonders for my new growth. 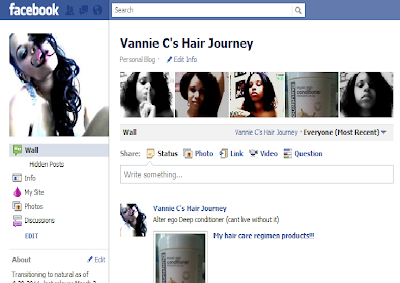 Hairlicious Org Now on Facebook!!! CLICK HERE TO SUPPORT AND FOLLOW OUR PAGE!!! Just testing out this app! Hope this app is good so I can post more frequently on this blog!! I think the only problem will be my typos (lol) I hate reviewing what I type when I am on my phone- so if you see typos or any other craziness from now on, IM ON MY PHONE updating my blog! T-hee! -This official Blogger app allows you to upload pics from your photo album or take a picture and upload it directly to the blog! I think Im gonna like this! Currently 7 months post (transitioning phase). This transition, while I do have my moments of mild frustrations, I am pretty much enjoying and gathering more information along the way. 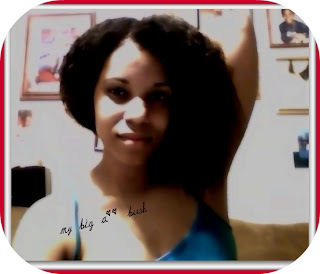 I have not changed any of my products so my hair care regimen is still the same and very very simple. So many people are anxious to finally see me big chop. I am not focusing on that any longer, I will only focus on maintaining my hair in a healthy state and taking it from there. 7 months post!!!! Focused on going All the way! Cant begin to express how happy I am with this transition. 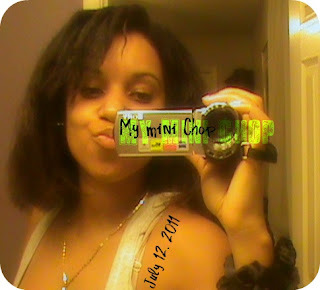 Love how much my hair has grown since I did my mini chop on July 12. I really must thank Hairfinity for a lot of my hair progress. The thickness and gaining length like crazy is amazing to me. Keep in mind that I snipped here and there a couple of times after I did my mini chop only because I wanted to inspire myself to go for the BC. No luck yet. I must wait it out some more. WOW. I still remember that I could not go beyond 8 weeks without relaxing my hair- to now be at 7 months is so amazing to me. Some of you ladies that are like 10 thousand months post (lil jokie joke) are probably like "7 months? Big deal"- but honestly to me it really is. I am so happy and needed to document it on my blog!!!! Alma V FT. Y.A "Mysterious Pressure"
I am no longer in great control of my hair. It wants to do what it wants to do when it wants to. But who ever said transitioning to natural would be a regular walk in the park? If this is your idea of transition, then this may not be for you. One must have a great amount of patience and accept that it is inevitable to experience breakage due to the two textures. Now that I am approaching month 7, I must say it is the hardest and most challenging but in no way does my mind enter the thought of ever relaxing again. Relaxer days are so over!!!!! 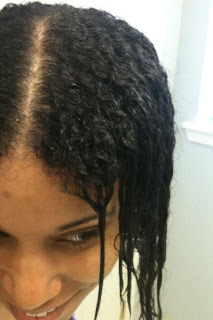 My really thin relaxed hair would take me anywhere between 3-5 minutes tops to detangle, Now? 40 minutes easy!!! See why you must practice patience? I have learned that once I achieve my fully natural hair I will no longer just be able to comb and walk right out the door.............. Natural hair requires more time and dedication.